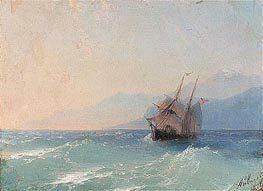 Ivan Konstantinovich Aivazovsky (Russian: Иван Константинович Айвазовский, Armenian: Hovhannes Aivazovsky July 29, 1817 - May 5, 1900) was a Russian painter of Armenian descent, most famous for his seascapes, which constitute more than half of his paintings. 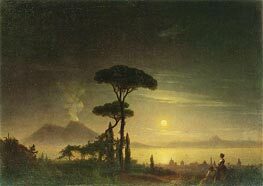 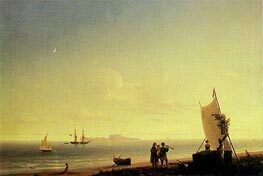 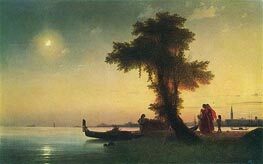 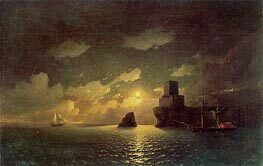 Aivazovsky was born in the town of Feodosiya, Crimea, to a poor Armenian family. 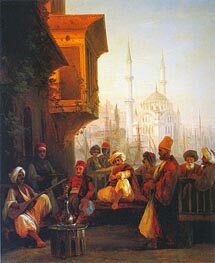 His parents family name was Aivazian. 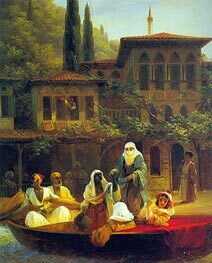 Some of artist's paintings bear a signature, in Armenian letters, "Hovhannes Aivazian". 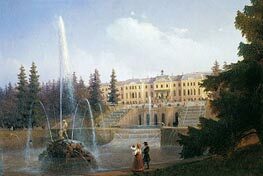 His talent as an artist earned him sponsorship and entry to the Simferopol gymnasium №1 and later the St.Petersburg Academy of Arts, which he graduated with the gold medal. 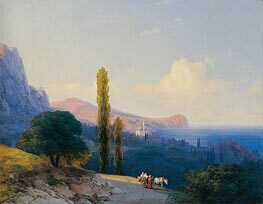 Earning awards for his early landscapes and seascapes, he went on to paint a series of portraits of Crimean coastal towns before traveling throughout Europe. 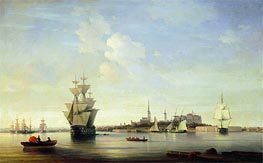 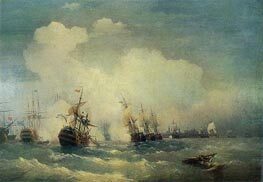 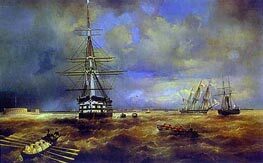 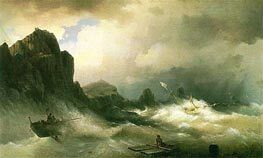 In later life, his paintings of naval scenes earned him a longstanding commission from the Russian Navy. 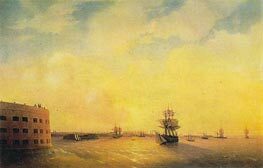 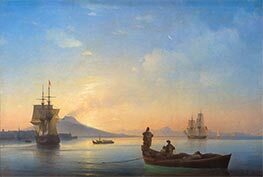 In 1845, Aivazovsky went to Istanbul upon the invitation of Sultan Abdulmecid, a city he was to travel to eight times between 1845-1890. 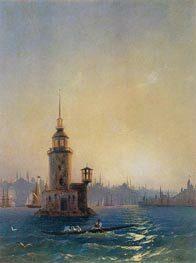 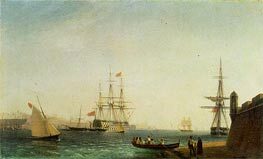 During his long sojourn in Istanbul, Aivazovsky was commissioned for a number of paintings as a court painter by the Ottoman Sultans Abdulmecid, Abdulaziz and Abdulhamid, 30 of which are currently on display in the Ottoman Imperial Palace, the Dolmabahce Museum and many others at various other museums in Turkey. 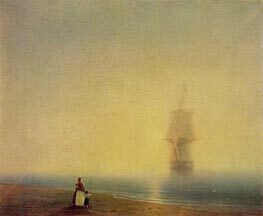 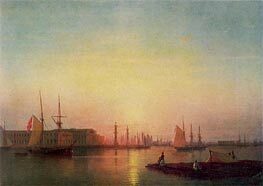 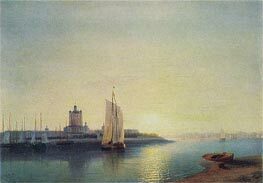 Due to his long life in art, Aivazovsky became the most prolific Russian painter of his days. 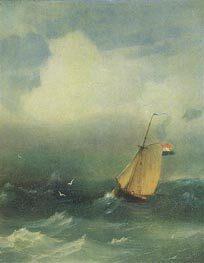 He left over 6,000 works at his death in 1900. 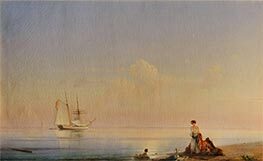 With funds earned during his successful career as an artist he opened an art school and gallery in his home town of Feodosiya. 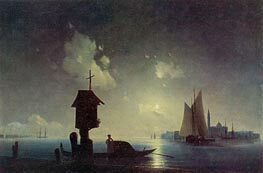 Aivazovsky's works have been auctioned for as much as $3,200,000, and his international reputation continues to grow. 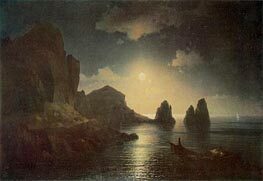 He is also said to be the most forged of all Russian painters.